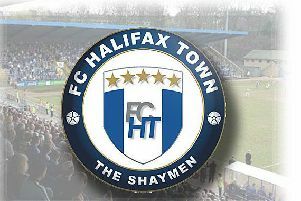 FC Halifax Town v Bromley at The MBI Shay Stadium, Halifax. Jamie Fullarton for Halifax. Town boss Jamie Fullarton said poor defending cost his side all three points after their 2-2 draw with Bromley at The Shay. Halifax twice took the lead through Josh Staunton and Devante Rodney, but were pegged back through Josh Coulson and Richard Brindley’s second-half goals. Coulson’s effort was a cross that went straight in without a touch, while Brindley’s came after a ball forward caused confusion in the Town defence. “I wouldn’t say it was a fair result based on chances, based on the second-half,” said Fullarton. “I thought it sparked into life second-half. “I think the reason we haven’t taken three points is because uncharacteristically for us, we didn’t defend our box well enough. “Poor goals for us, for our standards. “That’s cost us three points. We created multiple chances, we were exciting, the change in shape in the second-half meant we probably dominated possession more than we’ve seen to have done in previous games. “Whilst it’s end of the season, with two mid-table teams, I didn’t think it was that type of game in the second-half. “There were a lot of positives from our point of view. We speak about marginal gains, about progression, how we’re going to improve. It’s by making sure today’s game is three points instead of one. 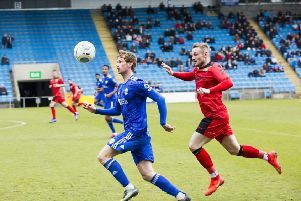 Rodney now has five goals in nine games for Halifax, and Fullarton says the Salford loanee has slotted in well at The Shay. “Sometimes certain players suit certain managers and styles,” said the Town boss. “It’s as simple as that. “You saw it here with (Scott) Hogan, who struggled here and went on to become a £9m player. “There’s factors that impact it, and what happens when a player fits and feels the way the team play or the way a manager is, in terms of how he plays, fits their attributes, then they enjoy it. “And when you enjoy something, you do it more. All these factors mean he’s hit the ground running.